We are very pleased to announce that we have teamed up with Tour Supply. We can't wish for a better partner to introduce our high-end guitar and bass guitar iso cabs to the U.S. market. Tour Supply is an established name in the professional touring industry. 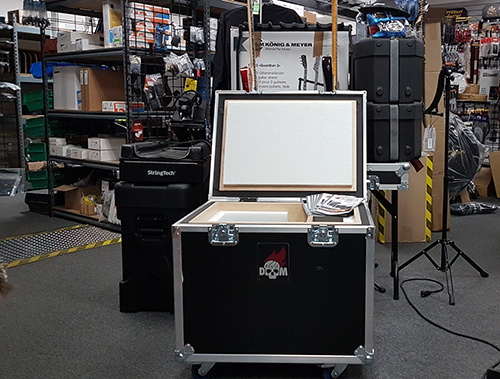 With multiple outlets throughout the U.S. and U.K. Tour Supply serves practically all international touring bands and their techs with gear, service, and support. No better place to have our Box of Doom units at display and ready for testing. Techs that start rehearsing with their bands at Third Encore (L.A.) or Rock Lititz (PA) please drop by the Tour Supply show room and ask for a demo. Also feel free to contact us. Tour Supply carries stock of our flagship the BoD AllXS Pro+ as used by Arch Enemy, Volbeat, Snow Patrol, Mastodon, Gojira and many many more. Don't hesitate to contact them at info@toursupply.com or 800-933-TOUR(8687).